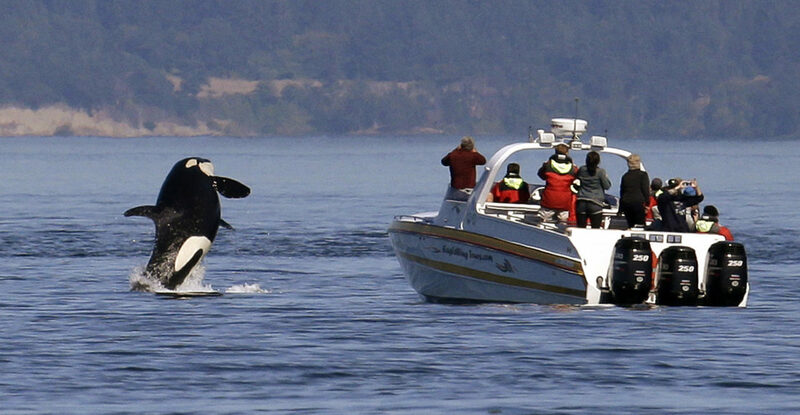 In this July 31, 2015 file photo, an orca leaps out of the water near a whale watching boat in the Salish Sea in the San Juan Islands, Wash. A Washington state task force on critically endangered Northwest orcas wants to temporarily suspend whale-watching boat tours focused on those whales. The group advising the governor voted Tuesday, Nov. 6, 2018 to recommend a three- to five-year moratorium on viewing southern resident killer whales by all boats in Puget Sound. The group advising Gov. Jay Inslee voted last week to recommend a three- to five-year moratorium on viewing southern resident killer whales by all boats in Puget Sound.